The Barking Spider™ is designed to redirect the noise, blast, and concussion forward away from the shooter (down range). It also increases the back pressure which in return can increase the reliability in a short barrel application where dwell time has been sacrificed for barrel length. The Barking Spider™ can be used on any barrel length but it really shines in short barrel applications. The Barking Spider™ can also be used to increase the back pressure for sub sonic or weak ammunition. The Barking Spider™ is Modular in a way that it can accept multiple different end caps, attachments, and thread protectors. The Modularity allows the operator to tailor the weapon system for a specific application. The front end of the Barking Spider™ has an integrated striking device or glass breaker with 1 1/8″ wrench slots for easy disassembly making cleaning and maintenance a breeze. The internals come out the front leaving the body attached to the barrel. This allows you to pin (perm attach) the body to the barrel to meet 16″ OAL requirements yet still be able to disassemble the muzzle device from the front. The Barking Spider™ was specifically designed to handle full auto and high volume fire. The Barking Spider™ features a cutting edge blast cone design which is supported in both the front AND the rear. 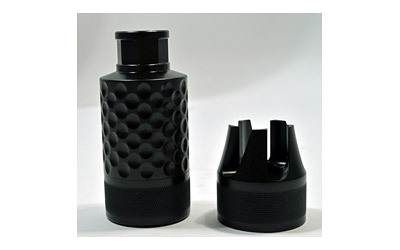 This feature not found on any other Krinkov muzzle brake eliminates the cone from sagging in extremely high temperatures. The Barking Spider™ is CNC machined on state of the art equipment using the highest quality materials available. The Barking Spider™ is 100% Made in the USA and features a Lifetime Warranty! Body is CNC machined from Billet 4140 Chromoly BAR stock. It’s ball dimpled to reduce weight and to help dissipate heat. The body comes pre-drilled for pinning to the barrel. The Barking Spider™ body is the correct length to make a 14.5″ barrel into 16″ OAL when perm attached. The body is heat treated and features an extremely durable Black Nitride QPQ finish. The front hex end is CNC machined from Billet 4140 Chromoly BAR stock, it’s also heat treated with a Black Nitride QPQ finish. The blast cone is CNC machined from Billet H13 Tool Steel, it’s also heat treated with a Black Nitride QPQ finish. The Barking Spider™ has an 8 sided hex in the rear with 3/4″ wrench slots which allows easy timing and installation. The Barking Spider™ includes a thread protector which covers the teeth on the striking device when it’s not in use. This eliminates the risk of snagging or damaging the threads. The Barking Spider™ also includes a 5 prong Helix flash suppressor cap which greatly reduces the flash being thrown down range. The Modular design allows you to change configurations around in seconds by simply unscrewing the attachment and screwing on a different one. We offer additional attachments which are not included. Available in 5.56 (1/2″-28) and 30 caliber (5/8″-24).